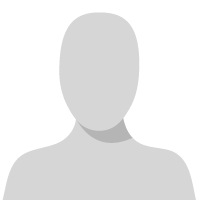 I need to create a connection between a contact and an account when the account is updated so there is a record of employment history. I have created an action that performs this successfully. In the workflow that triggers the action, Target is required as a parameter as well as those that I have created in the action (OldAccount and Contact). What is Target? It appears to want a connection record however at the point of calling the action a connection record won't exist as the action is creating the connection record. ​Could you post your code? Remove the RequiredArgument attribute from your action parameter Target and make sure that your action can process without it. What's in the bottom half? Nothing? If that is the case then you have to deactivate/reactive the process. It sounds like you have a corrupted process configuration. 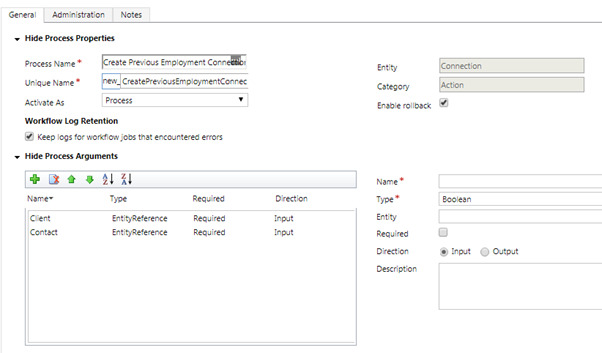 In an action that is based on an entity (connection in the screen shot above) the Target parameter is added and is an EntityReference to the record that was created/updated/deleted to trigger the action. 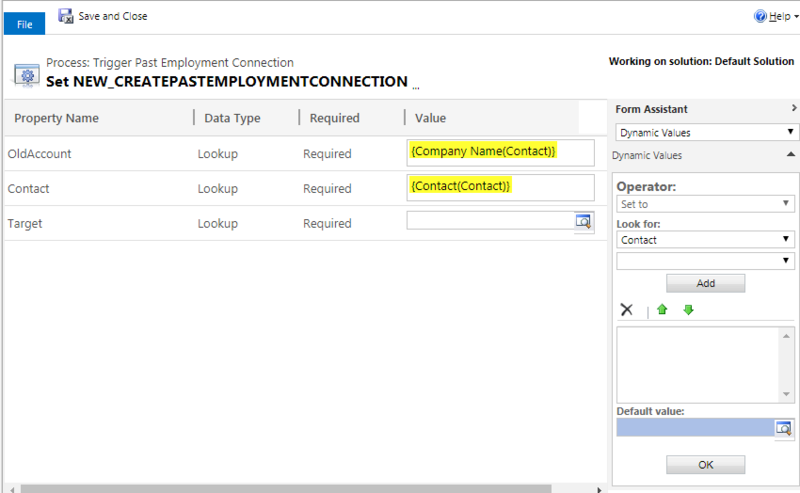 If your action creates a connection entity then perhaps it should be based on a contact or account record. The Target parameter is implicit because the action is related to the Connection entity. You therefore need to run the action in the context of a Connection - this is what the Target parameter is specifying. You can't change this once the action has been created - you'll need to delete and recreate the action. However, don't create it with the same name, as CRM caches the metadata for actions very aggressively and you'll get all sorts of errors complaining that you haven't filled in parameters that don't even exist any more.